The Corkscrew Turntable ruins and the Silverton Railroad right-of-way have long been popular destinations for hikers and history buffs. Those historically significant properties in the Red Mountain Mining District will be permanently conserved and protected under a new management plan between Ouray County and the Ouray County Historical Society (OCHS). A third partner, the Ridgway-based Trust for Land Restoration (TLR), made the arrangement possible through the donation of two patented mining claims, the Mona Queen and Little Mona, to the county. The historic Corkscrew Turntable and a portion of the Silverton Railroad grade are within those properties. The two sites are east of U.S. 550, approximately one mile north of County 31. The Ouray County Board of County Commissioners (BOCC) accepted TLR’s donation at a regular meeting this past July. The official closing on the property sale is scheduled for October 5. 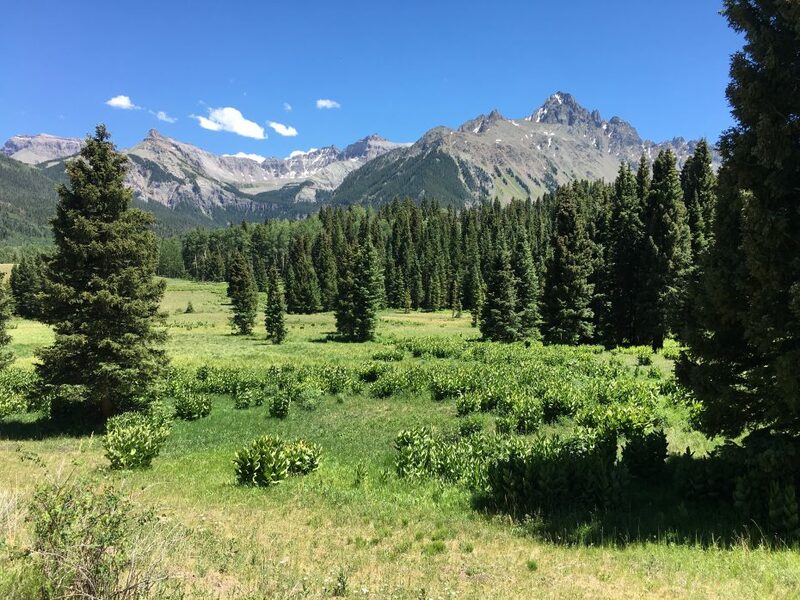 The commissioners acknowledged the historical significance of the Corkscrew Turntable and the narrow-gauge Silverton Railroad as well as increasing development pressure in the county’s Alpine Zone. The BOCC accepted the donation on the condition that the OCHS would assume responsibility for managing the historic claims on behalf of the county. The OCHS has agreed to the terms of the management plan. In 1888, Otto Mears completed the Silverton Railroad to tap the rich silver mines on the Ouray side of Red Mountain Pass. The Corkscrew Turntable provided a way of turning a train around in the small space near Corkscrew Gulch without backing the engine down or running it up the dangerously steep grades. A feat of early engineering, it is reputed to be the only turntable ever constructed on the mainline of a U.S. railroad, according to Don Paulson, curator of the Ouray County Historical Museum. Each summer and fall, Paulson leads several guided hikes along the railroad right-of-way and to the turntable site. The preservation plan began more than four years ago when TLR learned that the Greenfield Multistate Environmental Trust had been appointed to oversee the bankruptcy of Tronox Corporation, former owner of 16 mining claims in Ouray County. Working with local citizens, TLR acquired the 16 claims with the help of a grant from the Toan-O’Brien Foundation of Sante Fe, New Mexico. In December, 2015, TLR donated 14 of the claims to the U.S, Forest Service and has now transferred ownership of the remaining two claims to Ouray County. “What looked like a much simpler transaction to complete four years ago, when Bob Risch and Ben Tisdel first brought these properties to our attention, turned out to be much more complicated than we would have ever thought, due mostly to the circumstances surrounding the Tronox Corporation bankruptcy and a huge legal settlement with Tronox’s once-parent company, Kerr-McGee. We owe a great deal of thanks both to the Toan-O’Brien Foundation for their support and patience, and to US Senator Michael Bennett, who exerted pressure on both the EPA and the Greenfield Multistate Environmental Trust to get this deal done,” said Pat Willits, TLR Executive Director. The OCHS has agreed to monitor the Corkscrew Turntable and section of the railroad grade through regular site visitations. Historical Society board members will ensure that the property is maintained in its current condition and provide annual reports on the sites to the BOCC. TLR also is moving forward with two other regional conservation and preservation projects. In San Juan County, the organization is working to save the Red Mountain SNOTEL site, located on the Aurora patented mining claim. SNOTEL stations are important tools of the federal Natural Resource Conservation Service (NRCS). The NRCS Snow Survey and Water Forecasting Program provides information on future water supplies to western states through analysis of snowpack water equivalent. The owner of the Aurora mining claim has put the property up for sale. Last year, he informed the NRCS that the SNOTEL monitoring equipment must be removed from the site. TLR is now negotiating with project partners and the property owner on a purchase, hold and transfer deal. The goal is to purchase the site and then transfer ownership, including SNOTEL equipment, to a consortium of western Colorado water conservation districts. Back in Ouray County, another joint TLR/OCHS project would preserve and stabilize four historic structures known as the Idarado Houses. Prominent reminders of Ouray County’s mining heritage, the wood structures first housed workers at the Sunnyside Mill in Eureka around the turn of the 20th Century. The Idarado Mining Company purchased the buildings in 1948 and moved them to the present location just beyond the interpretive overlook in the Red Mountain Mining District. The mining company still owns all four buildings, two of which are on U.S. Forest Service property. Idarado miners and their families lived in those houses until the company shut down operations in 1978. Curious hikers and motorists passing by the site often stop to investigate the structures which are in various states of disrepair. TLR’s long-term objective is to acquire the four houses and eventually transfer ownership to either Ouray County or the Ouray County Historical Society. Public ownership of the Idarado Houses would make them eligible for grants from the State Historical Fund. OCHS is partnering with TLR on the management plan. Fortunately, the two organizations recently achieved an important first step in the process. They have received assistance from the Colorado Department of Public Health and Environment to obtain an environmental assessment of the site.